We’ve all heard the saying “ Mmm Mmm Good!” Campbell’s famous soup slogan whets the appetite and makes us think of the delicious tastes we expect when eating soup. Taste is one of the qualities soups provide but it also offers much more. During the long winter months, soup can be a very satisfying and nourishing meal loaded with health benefits. Let’s take a look at what it has to offer. Satiety – The definition of satiety, according to Nutrition textbook (5th edition, 2014), is “a feeling of satisfaction and fullness following eating that quells the desire for food.” Soup satisfies due to its high water content tricking our bodies into thinking of it as food and not a drink. Barbara Rolls, Ph.D., nutrition scientist and researcher at Penn State University, has conducted studies showing that when women ate soup before eating lunch, they consumed 100 fewer calories total at that meal. The satiety feeling remained with them throughout the day and they did not eat more at dinner to make up the calorie difference. 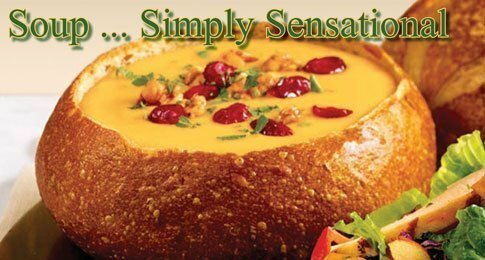 Soups satisfying power is lies in the multitude of sensory stimulation it provides – warmth, taste, aroma and visually seeing the different ingredients in the bowl. Aids in weight loss – The satiety or fullness feeling soup provides leads to eating fewer calories. A research study published in Appetite resulted in people eating 20 percent less when they began lunch with vegetable soup compared to those who skipped the soup. Another research study from the Baylor College of Medicine, in Houston, showed that a group of overweight men and women who ate soup daily had better maintenance of their weight loss. Fiber – Vegetables and or beans, rich in dietary fiber, often are the main ingredients in many soups. Fiber is important for preventing constipation and regulating blood sugar and blood cholesterol. Provides water to prevent dehydration – We tend to drink more fluids in the warmer months but drinking enough fluids during cold months is important, too. Soup is a convenient method of getting in the fluids you need in addition to warming the body. Antioxidants – Antioxidants are substances neutralizing free radicals, preventing oxidative damage to cells. Since most soups contain vegetables rich in antioxidants, plus vitamins and minerals, this is a perfect way of obtaining these necessary healthful nutrients in our diet. Whether you eat soup from a can or make it from scratch, it comes up a winner most every time. One concern of eating soup however, particularly canned soups, is the sodium content. It’s not unusual to find over 700 milligrams of sodium in one cup of canned chicken noodle soup. The Dietary Guidelines for Americans recommends no more than 2300 milligrams of sodium each day. People 51 and older and those of any age who are African Americans or who have high blood pressure, diabetes, or chronic kidney disease should further reduce sodium intake to 1,500 milligrams per day. Look for low sodium versions of your favorite brands or make soup from scratch and that puts you in control of how much sodium or salt you add. This winter, stir up some batches of soup and see for yourself that it is indeed not only good food but good for you. Following are three soup recipes to try out – all easy to make and all taste delicious! In a medium skillet, cook the ground beef or turkey until browned. Drain, and set aside. Place the ground meat, onion, pinto beans, kidney beans, corn, tomato sauce, water, diced tomatoes, green chilies and taco seasoning mix in a slow cooker. Mix to blend and cook on low setting for 8 hours. 1. Heat the oil in a large soup pot over medium heat. 2. Add the onion and cook, stirring occasionally, until softened and translucent, about 4 minutes. 3. Add the garlic and cook until fragrant, about 1 minute. 4. Add the tomatoes, tomato paste, and chicken broth and bring to a boil. Reduce heat and simmer about 15 minutes. 5. Remove from heat and allow to cool slightly about 15 minutes. 6. Working with 1 cup at a time, puree the soup in a blender until smooth and then transfer the puree to another pot. 7. Stir in the cream, sugar, salt and white pepper. Serve garnished with the chives. Makes 4 1-cup servings. 1. Heat oil in 3-quart saucepan over medium heat. Cook onion and carrots in oil about 5 minutes, stirring occasionally until onion is tender. Stir in mustard seed, salt and pepper. Stir in broccoli, broth and water. Heat to boiling; reduce heat. Cover and simmer about 10 minutes or until broccoli is tender. 2. Place one-third of the broccoli mixture in blender. Cover and blend on high speed until smooth; pour into bowl. Continue to blend in small batches until all soup is pureed. 3. Return blended soup to saucepan. Stir in lemon juice. Heat over low heat just until hot. Stir in sour cream. Cheryl Mussatto MS, RD, LD, is a registered dietitian who works as an adjunct professor at Allen Community College, where she teaches a course called Basic Nutrition. She is also a certified health and wellness coach. She writes Eat Well to Be Well, a column about health and nutrition, and may be contacted at [email protected].